What would life be like without Daylight Saving Time? What would it be like if we didn't change our clocks twice a year? We would still experience those later sunsets in the summer, but you would most notice the change during the winter months. Did you remember to turn back your clocks over the weekend? We are now on Standard Time as we "fell back" Sunday morning. But what if we didn't have Daylight Saving Time? What if we stayed on Daylight Saving Time all year round? These are a few questions we asked, and below is what life would be like if we stayed on a specific time all year long. 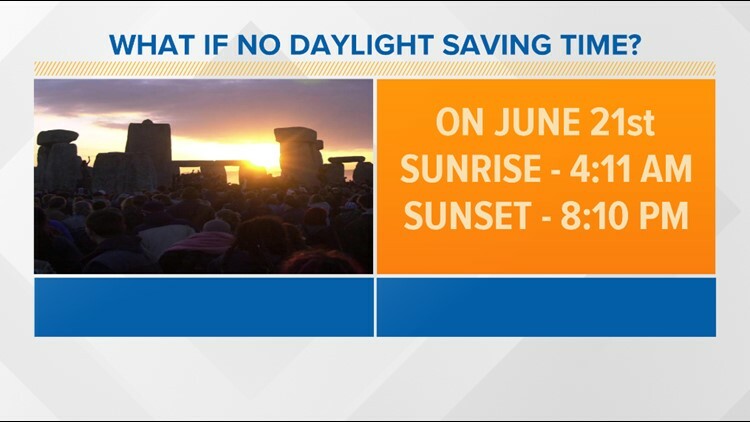 If we were on Standard Time the entire year, we would notice it most during the summer months (when we currently observe Daylight Saving Time). During the longest day of the year, June 21, the sun would rise at 4:11 a.m. However, the sun would set at 8:10 p.m. I don't know about you, but I really enjoy the later sunsets during the summer months. What if we were on Daylight Saving Time year round? We would experience those later sunsets in the summer, but you would most notice the change during the winter months. 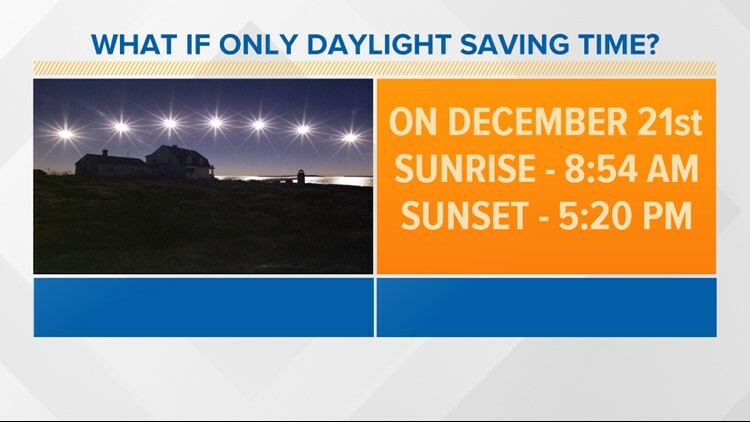 On the shortest day of the year, December 21, the sun wouldn't rise until 8:54 a.m. That's almost a 9 a.m. sunrise. And the sun would set at 5:20 p.m. It's important to note that we're not changing how much daylight there is in a day, just when we observe the daylight. The winters will still be short and dark, and the summers will always have really long daylight hours. We're just changing the time at which we experience them. There are already a few states that don't observe Daylight Saving Time; Arizona and Hawaii. And, on Election Day, California will vote to possibly stay on Daylight Saving Time year round.